An open mic Wednesday night at Threadgill’s began SWRFA. I didn’t get to that event, opting not to spend an extra night in the hotel. Except for the fact that I would have liked to have gone to Threadgill’s, it turned out to be a good decision. For one thing, I was told that it was completely packed. Come to find out that if I had played in that open mic, I wouldn’t have been able to play at either of the other two open mics. Because there were so many attendees, each act only played one song at the open mics. So I figured I made the right decision. We’ll see about next year. On Thursday, registration was to begin at 2 p.m. I arrived about 1:30. 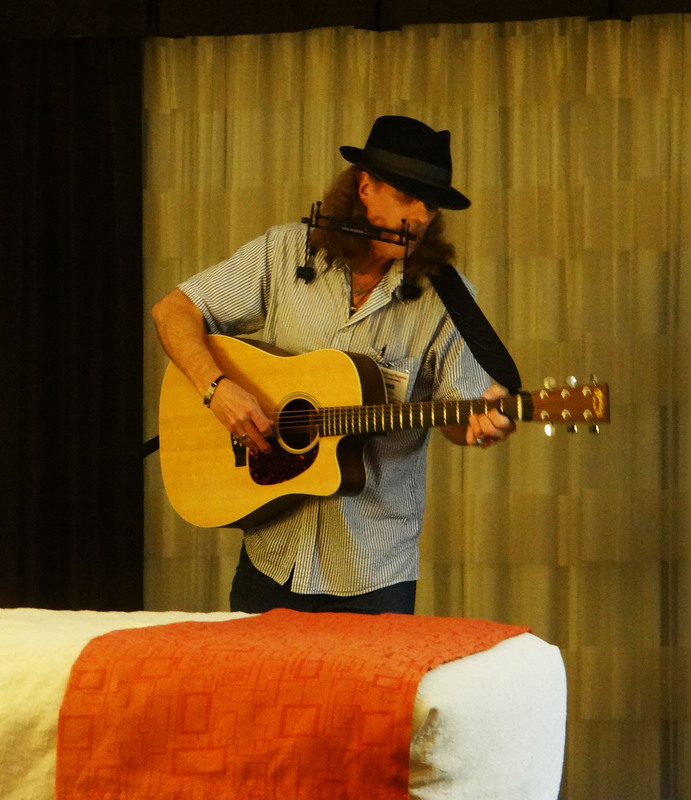 While we waited on our rooms to be ready, a guitar was passed around the lobby. It wasn’t too long before my room was ready. I made two trips to the room, parked the car and went to register for the conference – which is, and isn’t, the right term for it. The pool party/open mic began at 5 p.m., with Berkalin Records providing a dinner buffet and drinks. I have some pictures from the open mic that I will post on Facebook when I get a chance. Following the open mic was the official showcase alternates concert. Which would be those acts who didn’t get chosen for the two official showcase concerts on Friday and Saturday. After which, song circles popped up around the hotel. And events were just getting started. More to come.